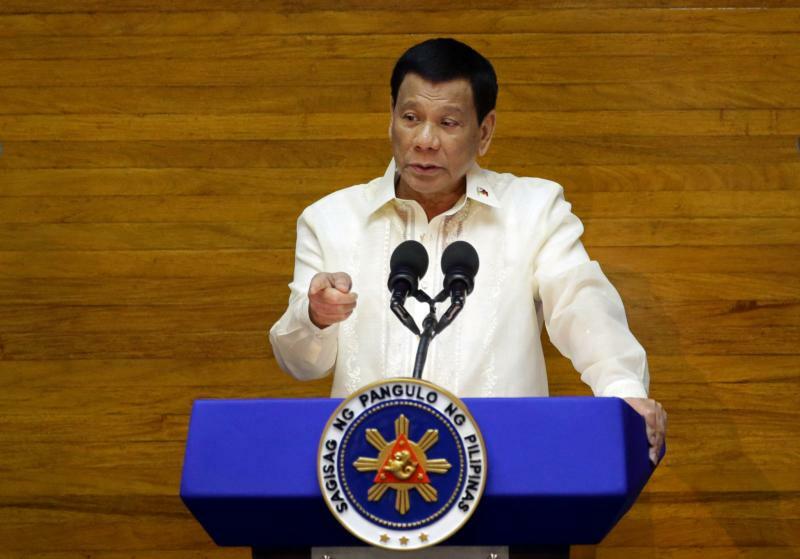 MANILIA, Philippines (CNS) — Philippine President Rodrigo Duterte warned the public during his third State of the Nation address July 23 that his two-year war on drugs would become even “more chilling” in the coming days. Earlier that day, a group of human rights advocates attended Mass before taking to the streets of Manila armed with banners and placards calling for an end to extrajudicial killings, rallying for “democracy, justice, and freedom,” and demanding Duterte step down from office. During the Mass, the bishop who delivered the homily reminded parishioners that some 23,000 people have been slain as part of Duterte’s brutal campaign against narcotics pushers and users, ucanews.com reported. Some didn’t need reminding; they already had lost family members to what critics see as a campaign of state-sanctioned murder, with many suspects gunned down before being able to defend themselves in court. Nanet Castillo is a case in point. Her son was killed during the first wave of the war on drugs in 2016. “We continue to seek and wait for justice to be served,” she said. Human rights groups have described the past two years as the “worst years for human rights” in the Philippines since the declaration of martial law in September 1972. Karapatan, a local group of rights activists, described the country as being in a state of crisis under Duterte. “This government is even worse than all the other administrations that followed the period of martial law,” said Cristina Palabay, one of the group’s members. She said the body count from drug-related killings at the hands of security forces already has surpassed the number of deaths recorded during the martial law years of late dictator Ferdinand Marcos. Meanwhile, Amnesty International Philippines said the country has become a “far more dangerous place” because of the impunity and lack of accountability police officers enjoy in carrying out Duterte’s mandate. The president has “created a culture where anyone can kill or be killed,” said Jose Noel Olano, Amnesty’s director of operations in the Philippines. He also took issue with Duterte’s “shortsightedness in accepting criticism” and “resistance to recommendations” on policy, claiming his actions have helped create an environment where people’s human rights are being trampled upon on a daily basis. Lawyer Harry Roque, a presidential spokesman, said such claims were unfounded as the anti-narcotics drive has been conducted legitimately. Even members of the Catholic Church are being persecuted, she said. In December, Father Marcelito Paez was gunned down in Nueva Ejica province after facilitating the release of a political prisoner. Since January, four foreign religious missionaries, including Sister Patricia Fox, an Australian who is Philippine superior of the Sisters of Our Lady of Sion, have been arrested, detained, deported or threatened with deportation after they were accused of participating in political activities opposing the state. Catholic priests and Protestant ministers also have become more vocal in taking issue about threats, harassment and surveillance conducted against them by the apparatus of the state. Karapatan claims to have records showing 169 cases of “extrajudicial killings” during the first two years of Duterte’s rule, significantly higher than the 103 cases reported during the same period under former president Benigno Aquino. Moreover, from July 2016 to June 2018, at least 432,380 individuals have reportedly been displaced, compared to 9,756 under Aquino, the rights group said. On July 16, at least 1,600 tribal people from 15 communities in the towns of Lianga and San Agustin in the southern Philippines fled their homes because of military operations. Karapatan noted many more cases of illegal arrests and arbitrary detention during the early years of the current administration. It listed 359 cases over the past 24 months in which people where illegally arrest and detained, and another 1,695 where suspects were apprehended unlawfully but not detained. “The majority of those who were arrested illegally were human rights activists, environmental defenders, union leaders and poor people in big cities,” Palabay told ucanews.com. The bulk of the cases occurred in Mindanao, where martial law was declared at the onset of a five-month armed conflict in the city of Marawi that began on May 23, 2017, the group said. Since then, at least 72 political killings have been reported in the region. Even students and teachers apparently have not been spared. Save Our Schools Network reported 535 attacks on schools in tribal areas of Mindanao from July 2016 to April 17, 2018. “We also documented at least 30 occasions of military encampment on tribal schools, with over 3,000 students affected,” said Rius Valle, network spokesman.